We’d love your help. Let us know what’s wrong with this preview of THE ELEMENT ENCYCLOPEDIA OF FAIRIES by Lucy Cooper. Fairy expert Lucy Cooper examines the long history of fairies in our world, both ancient and modern. From the Fates of ancient Greece and the Sidhe of the Celts to the Cottingley Fairies of Yorkshire and the Djinn of Arabia. To ask other readers questions about THE ELEMENT ENCYCLOPEDIA OF FAIRIES, please sign up. What a delightful resource! This encyclopedic reference book offers a wealth of information on all kinds of fairies and fantastic creatures (brownies, djinn, demons, nymphs, dwarves, etc.) from a wide range of cultures: not just European, but also Asian, African, Middle Eastern, and various Native American tribes. It also contains bios on some of the great researchers and contributors to fairy-tale literature. Keep in mind that the Element Encyclopedia of Fairies is a "launch pad" of sorts. Some What a delightful resource! 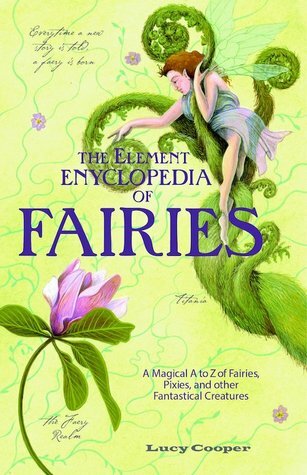 This encyclopedic reference book offers a wealth of information on all kinds of fairies and fantastic creatures (brownies, djinn, demons, nymphs, dwarves, etc.) from a wide range of cultures: not just European, but also Asian, African, Middle Eastern, and various Native American tribes. It also contains bios on some of the great researchers and contributors to fairy-tale literature. A great introduction to the world of the Fae. This book covers different names and spellings of the names of Fae and regions where they can be found and even has anecdotes and quotes from old texts. Explanations of what Fairies are, where Fairyland is, how to connect with Fairies and the different types of Fairies makes this an excellent resource. The illustrations, though, could’ve been more varied or left out entirely. This book is a good start on a lifelong journey for those interested in the Fa A great introduction to the world of the Fae. This book covers different names and spellings of the names of Fae and regions where they can be found and even has anecdotes and quotes from old texts. This book is a good start on a lifelong journey for those interested in the Fae and in folklore. An amazing read that will layer an author's understanding of all the myths and legends behind Fairyland. Destined to become a classic and should be required reading for all things fairy. Chocked full of interesting tales, legends, ideas to inspire your muse, enjoy the ride. An outstanding book! Thank you Lucy Cooper!!! Wonderful, informative reference on the wee folk. I only gave it four stars instead of five because the same five or six illustrations (small sketches) were used again and again to represent all the different faeries. It would be so much more enjoyable with more pictures! For the most part, I liked this book and found it informative. I have 3 complaints. 1. The little drawings are nice, but they are like clip art and used repeatedly. Would have preferred to have none if they weren't really being used to describe the entry. 2. There was a fair amount of repetition. I understand that often times, entries overlap but there has to be a better way than using the same description word for word. 3. I would have greatly appreciated how to say the names. Some I know already For the most part, I liked this book and found it informative. I have 3 complaints. 3. I would have greatly appreciated how to say the names. Some I know already, but others were completely new to me and in a language I'm not familiar with. this series is a good starter pack. it contains brief information on a lot of different things, and is a good place to do beginner reference and expand further from there. i'm also a sucker for the format and style of the books - they just look good, and i can't help but think of how good they'd look together on my bookshelf. as a bibliophile, i really like this series. obviously, don't consult these for in-depth research. but, again, they're a good place to start broad, wide-ranging consultation this series is a good starter pack. it contains brief information on a lot of different things, and is a good place to do beginner reference and expand further from there. i'm also a sucker for the format and style of the books - they just look good, and i can't help but think of how good they'd look together on my bookshelf. as a bibliophile, i really like this series. Lucy Cooper's exploration of Fae-kind is informative, well-written and excellently paced. I read this as a research tool and discovered far more than I was expecting. Instead of being just a list of the different kinds of Fae, Cooper delves into the history and origins of faerie mythology, breaking up the encyclopedic element with engaging and relevant tales. I would recommend this to anyone who wants to find out about the world's link with mythological creatures. Lucy Cooper is a writer with a special interest in folk tales, fairy tales and mythology. She grew up in Cornwall, on the southwestern tip of England, a land steeped in tales of the “little people”. Her fascination with folk tales, myth and legend has taken her from the temples of China, to the back roads of Bulgaria, and lots of places in between. She has a degree in anthropology and an MA in Pro Lucy Cooper is a writer with a special interest in folk tales, fairy tales and mythology. She grew up in Cornwall, on the southwestern tip of England, a land steeped in tales of the “little people”. Her fascination with folk tales, myth and legend has taken her from the temples of China, to the back roads of Bulgaria, and lots of places in between.